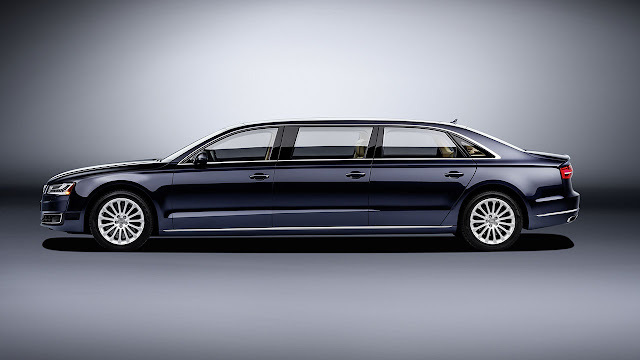 Audi has gone to even greater lengths to deliver all of the familiar trappings associated with its flagship A8 L model in an entirely unique format of considerable proportions. At the special request of a European customer, the premium brand has created the Audi A8 L extended, a built-to-order model measuring 6.36 metres (20.9 ft) in length and with a wheelbase of 4.22 metres (13.8 ft). 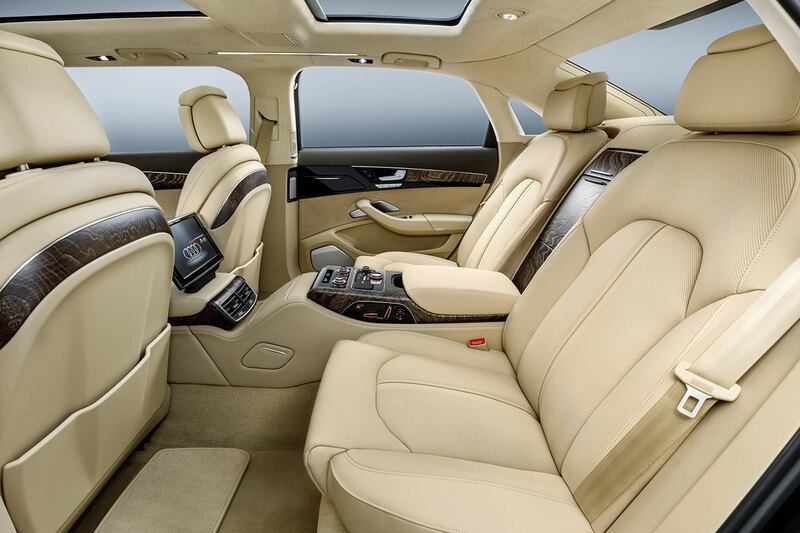 The A8 L extended affords exquisite comfort for passengers occupying all of its six seats. Audi has further requests for the custom product already. 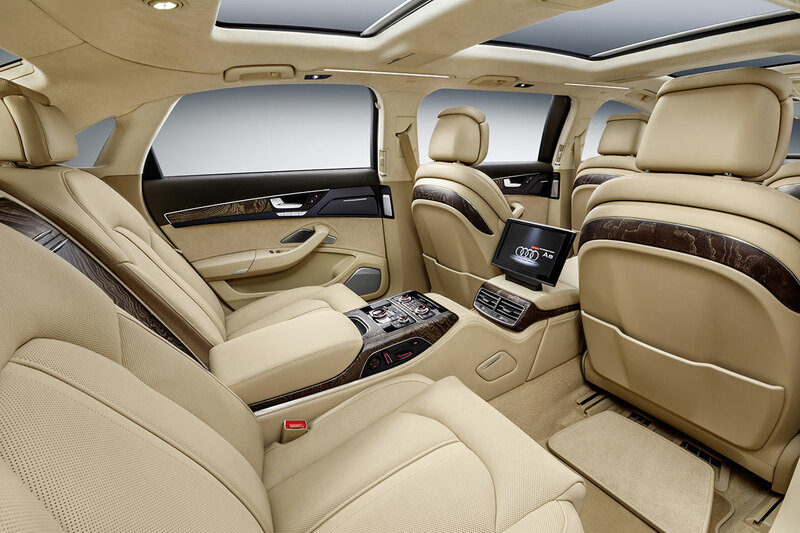 Experts invested almost a year in developing and building the exceptionally long luxury saloon. The result was an exclusive one-off specimen that meets the high standards of the production model in every domain. The major challenges concerned the safety and rigidity of the extra-large body, as well as the styling of the silhouette. 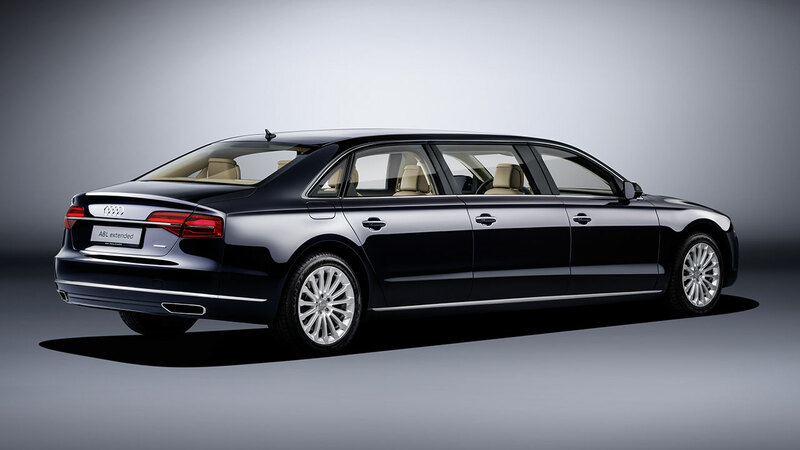 The Audi A8 L extended benefits from the low weight of the production model’s body, which uses an Audi Space Frame design and is made almost entirely from aluminium. For the built-to-order version the engineers extended the side sills and centre tunnel using extruded aluminium sections. Inside the tunnel, these also assist with the air routing. A double rear bulkhead separates the passenger compartment from the luggage compartment; the roof incorporates additional aluminium profiled tubes and cross-braces. 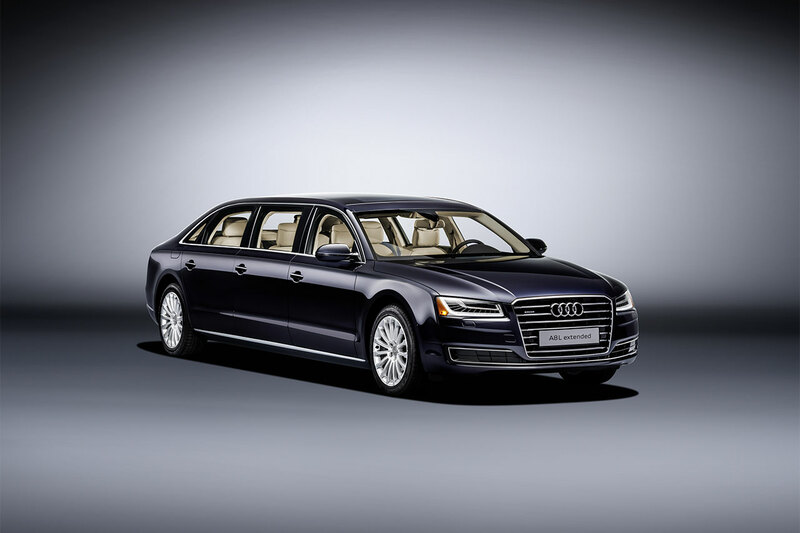 These measures provide torsional and flexural rigidity almost on a par with the A8 L.
The representative XXL saloon in discreet moonlight blue, metallic offers 1.09 metres (3.6 ft) more wheelbase and overall length than the Audi A8. 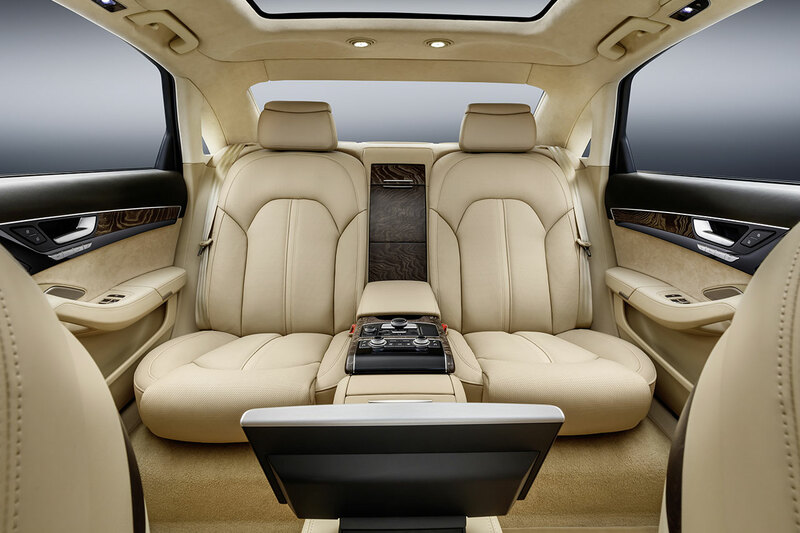 To maintain a harmonious roof line, the entire body from the A-pillar back has been reworked. 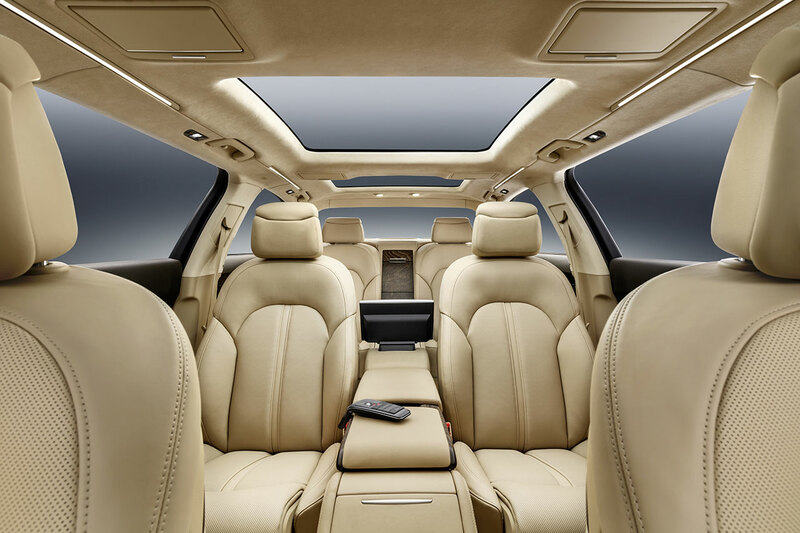 The experts embedded a 2.40-metre (7.9 ft) glass panel in the roof skin to enhance the sense of spaciousness. All passengers face the direction of travel in the Audi A8 L extended. The six seats are upholstered in extra-supple Valcona leather, in the colour velvet beige. Rows two and three feature electrically adjustable individual seats. The third row has a continuous centre console, a Rear Seat Entertainment display and a cool box. The one-off A8 version is powered by a 3.0 TFSI engine developing 310 PS, delivering up to 440 Nm (324.5 lb‑ft) of torque. This propels the saloon from 0 to 62 mph in 7.1 seconds and up to an electronically governed top speed of 155 mph. An eight-speed tiptronic transfers engine power to the quattro permanent all-wheel drive system. 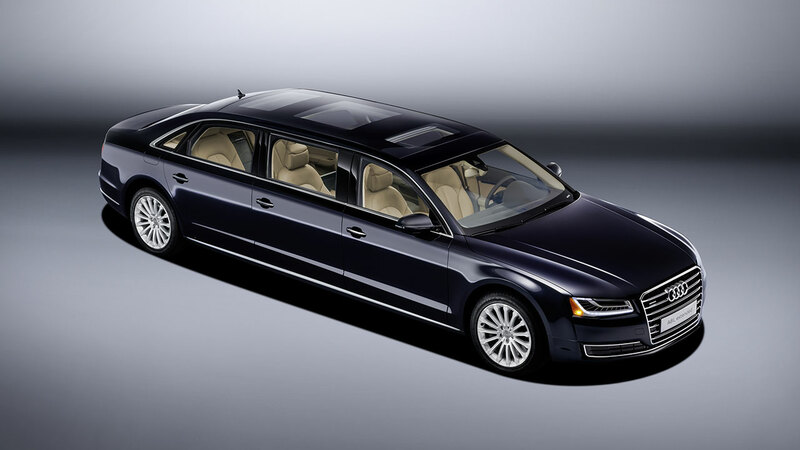 The 19‑inch wheels in 15‑spoke design conceal the brake system of the Audi S8, which assures outstanding deceleration of the over six-metre-long (19.7 ft) luxury saloon, with its unladen weight of 2,418 kilograms.